Home » Directory » O & S SPORTS CAR RESTORATION PTY. LTD.
O & S SPORTS CAR RESTORATION PTY. LTD.
We Restore Classic and vintage cars of all makes and models. Carrying out accident/insurance work has become extremely popular with us over the past 5 or so years as clients are appreciating the quality of work we do to our restoration side of the business, hence why they want the same quality mirrored to accident and insurance works to their classic and or modern european vehicle!! We are extremely unique in the fact that we restore and work on a highly vast array of classic vehicles at any given time. Our quality of work has put us to be one of the best in Australia which we are extremely proud of as every car we complete ends up being a concours winner which is pleasing for ourselves and most importantly the client. We are a one stop shop to complete and carry out anything associated with your classic vehicle. 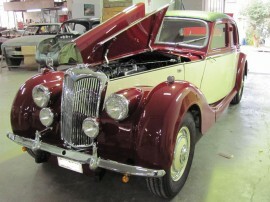 From Bodywork, paintwork,insurance/accident work, coachwork, rust work, file finishing, lead wiping, trimming, all mechanicals, suspension, aligning, adjusting of gaps, fitments of parts,french polishing, Chroming,concours detailing, electroplating of parts and hardware, machining of components or just simply advise on your classic vehicle!